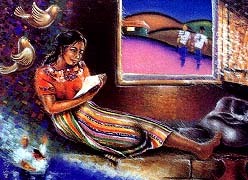 Oil paintings depicting stories from the scriptures, finely crafted pottery, needlework representing themes from the life of Christ, a quilt portraying the worldwide priesthood﻿—these artworks represent the variety of entries in the Second International Art Competition sponsored by the Church’s Museum of Church History and Art. More than eight hundred Latter-day Saint artists in forty-two nations responded to the museum’s call in February 1990 to create works of art featuring themes from the scriptures. Artists searched the standard works for their inspiration. 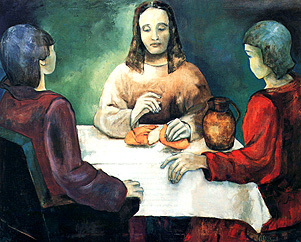 Then, utilizing varied artistic styles and mediums, they created appealing images based on scriptural themes. A six-member committee selected about two hundred of the entries to be displayed in the Salt Lake City museum. Among these are twenty winners of cash prizes and several purchase awards funded by an anonymous donor. The exhibition filled four museum galleries with works by talented beginners as well as by artists with years of experience. Art styles representing cultural traditions from every continent are included. Judges expressed delight at the high quality of the submitted artwork and at the artists’ creativity in representing the people, principles, stories, and messages found in Latter-day Saint scripture. Many of the participating artists accepted the challenge by creating art to express their testimonies of gospel principles: the Atonement, prayer, baptism, service, peace, and truth, for example. Others turned to Bible stories and events: the Creation, Adam and Eve’s expulsion from the Garden of Eden, Joseph’s coat of many colors, the trials of Job, the story of Esther, the Last Supper, the Savior’s trial in Gethsemane, and the revelation of John. Still others looked to the Book of Mormon, choosing topics such as the Liahona, the people of Limhi, the title of liberty, Christ’s visit to the Nephites, and Moroni with the plates. Modern scriptures inspired other themes, such as the First Vision, the coming forth of the Book of Mormon, missionary work, Christ’s appearance in the Kirtland Temple, and the pioneer trek. Certainly this competition has encouraged Latter-day Saint artists to express their faith through religious art, with the entire Church benefiting from their talents. In addition to the sampling of art seen in this issue of the Tambuli, other art from the competition will be published in future issues on the inside back cover or as illustrations for articles. The Disciples from Emmaus, alkyd and oil on canvas by Marie-France Guigny, Biviers, Isere, France. The Suffering of Jesus Christ, wood relief sculpture by Sebastião Dorival Rodrigues, São Paulo, Brazil. Amumn Petu: Go Ye Therefore, oil and acrylic on canvas by José R. Riveros, Santiago, Chile. Aaron and the Golden Calf, embroidery by Sven Spersberg, Stockholm, Sweden. 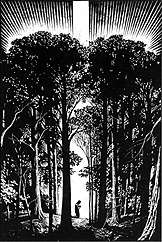 First Vision, linocut print on paper by Warren Luch, Salt Lake City, Utah. Book of Genesis: Chapter One, ceramic by C. Dean Draper, Fresno, California. 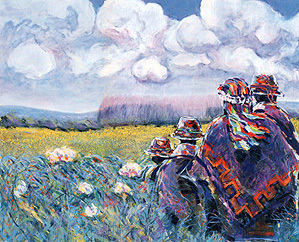 Ready for the Covenant, oil pastel on panel by Erick Duarte, Las Rosas, Guatemala. Glen M. Leonard is the director of the Museum of Church History and Art.